Home » job fairstitle_li=Lakeland Employmenttitle_li=Lakeland Jobstitle_li=Polk County employertitle_li=Polk County employmenttitle_li=Polk County jobstitle_li=Polk County Staffing Servicetitle_li=Winter Haven employmenttitle_li=Winter Haven jobs PHR Staffing Solutions: Coming to A Job Fair Near You! PHR Staffing Solutions is proud to serve our potential applicants with easy access to job applications. If you are looking for the perfect position, you can not only apply online, or in person, but also when we offer occasional “out-of-the-office” applications at job fairs and expos. This past week, we were happy to attend a job fair at The Lodge at Woodlake, where we enjoyed meeting and greeting applicants and taking their applications and resumes for our own files. We are ready to help match them to a job that is just right for their skill set and needs. Think you’re ready to host your own job fair? If you have an event venue (such as a clubhouse, party room, etc.) and would like to open it up to local businesses, we would love to attend! PHR Staffing Solutions can come out to your location and set up our own booth, complete with all the needed resources to make the time successful. We bring information about current job openings as well as applications for those positions, brochures about PHR, and more. Since we are there with our undivided attention, we can take time to answer individual questions, and we will receive resumes to fill to both current and upcoming positions. Not only will we attend your event, but we will also help advertise it. 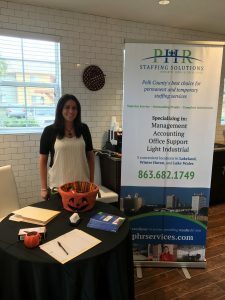 Whenever we have a job fair on the calendar, we promote it in our own literature and on our social media platforms, to ensure maximum success for both your event and for PHR Staffing Solutions. We look forward to seeing you at our next job fair or expo in or around Lakeland!